About 2 weeks ago my wife and I watched a great movie – The Blind side – which tells the story (somewhat fictionalized) of Michael Oher. I thought the movie was very good and very interesting and I had noted that it was based on a book. This book. So I went on Amazon and downloaded it to my Kindle. While the movie dealt only with Michael Oher – who (if you don’t know) is the left tackle for the Balimore Ravens – the book deals, to some extent, equally with the changes in the NFL that have made the quarterback – and thus the left tackle – so much more important. The book pretty much alternates chapters which retell Mr. Oher’s saga growing up as an underprivileged child in the worst parts of Memphis and getting adopted by a well-to-do family with chapters about the changes that have occured in the way NFL football has been played over the past 30 or so years. There are anecdotes from Bill Parcells and other football notables as well as discussions with the people in Mr. Oher’s life. While being a football fan definitely helps your enjoyment of this book – if you really don’t like football at all you might just want to watch the movie which I also highly recommend – it’s not totally necessary. Unlike many books centered around sporting events or figures, this one leaves a lot of the jargon at home (probably because the author, Michael Lewis, is not a football person) and tells of the evolution of modern football, including the changes that free agency brought, while at the same time telling a heart-wrenching story about a young man who – in spite of the odds – found love and family and made himself a success. I’ve read a lot of books that were turned into movies and they usually disappoint. My general rule is – either the book or the movie. This book – and this movie – are definitely the exceptions to the rule. As I said, if you don’t like football at all skip the movie. 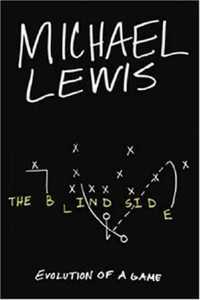 But, if you like it – even just watching a game on Thanksgiving, or going to cheer for your local high school team once a season – pick up The Blind Side: Evolution of a Game. I know you’ll enjoy it.